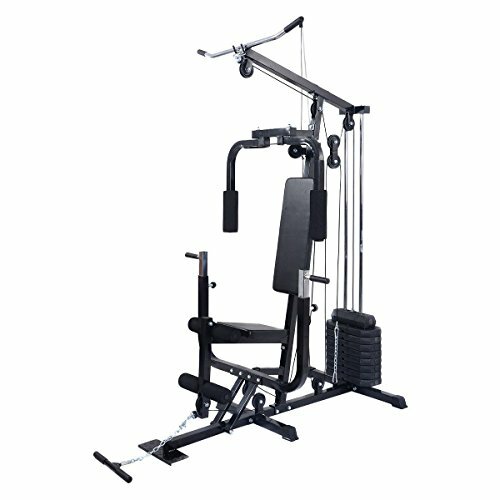 Seat height adjustment: 35" - 44"
Save yourself the time and hassle of a gym membership with this Gym System Strength Training Workout Equipment. This complete workout unit includes everything you need to engage your entire body for better health and more powerful, lean muscle growth. It features a high and low pulley system with up to 220 lbs of resistance. Use it to target and tone multiple muscle groups. It also has a combined chest presstterfly arms station with a 4-roll leg developer. Store it in a spare room or a garage for easy access. It has a sewn vinyl seat for a comfortable workout experience and comes with a step-by-step exercise chart to ensure you're maximizing each movement. When it comes to building your fitness, a home gym is a good alternative or supplement to a full gym membership. .